Riding boots have always been a closet staple, but this new take on the trend is taking over. These were made popular by Stuart Weitzman last year (but they are hella expensive), so fortunately this year there are some great quality options at much better prices. I love how sleek and high-fashion this style looks! This isn't really a new trend, but it's one that's really sticking around and for good reason. We all know that a pop of leopard or plaid is instant-chic, and a scarf is an easy and affordable way to achieve that look. 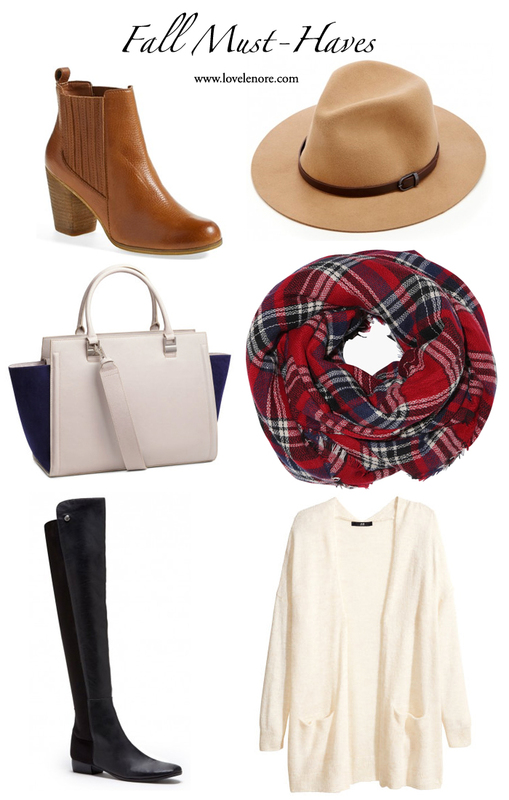 Plus I love that simply adding a scarf can completely change up what your top or sweater looks like (making your wardrobe stretch further). Booties have been huge for a couple of years now, but I've noticed a slight shift in the trend. The last few years it's been all about suede, and now it's shifting to leather versions. I've decided I like leather even better because they just look a little more polished and high end. Nothing beats a comfy suede bootie for a laid back look still, so don't toss yours by any means! I'm just putting my money toward a leather/faux leather pair this year (leaning toward saving and buying this pair). Also nothing new or mind-blowing, but brands are FINALLY starting to make more of them it seems like. I swear the last few years I could hardly find sweaters that covered my tush/hip area and I'm really not that tall. This year I've already found (and bought) several and I'm happy as a clam about it. These aren't something I like to spend tons of money on because honestly, affordable brands make awesome versions. I usually check Forever 21 and H&M first, but have had luck tons of places. If you love big (or gigantic) purses like I do, satchels are the way to go this year. They're big, but structured and super chic, even if you buy a low-end version. I've found that my H&M and Phillip Lim for Target satchels still look super polished and instantly pull my outfits together (and fit all of my makeup, snacks, notebooks...you know, the important things :) ).